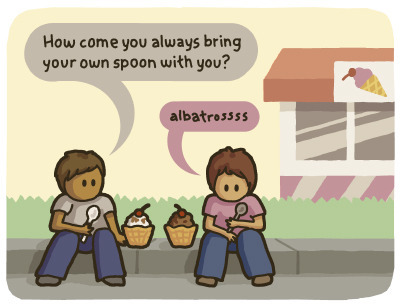 This is a story about albatrosses and spoons. Many Laysan Albatrosses squawk and dance and raise their chicks on a little atoll in the middle of the North Pacific called Midway. It’s as isolated as you can get. Still, bits of plastic trash (like bottle caps, toys, and spoons) wash from the land and down into the oceans, and currents carry it all the way out to Midway. 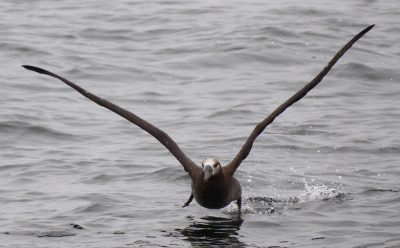 The albatrosses are very good at dancing and long-term relationship maintenance, but they’re bad at distinguishing plastic from delicious fish. This is where that spoon comes in. It’s ice cream and frozen yogurt season, and there are zillions of plastic spoons everywhere. But you can break the unlikely connection between plastic and albatross in many ways – and one way is to carry a metal spoon with you instead. There are some lovely ones; here’s one of my favorites. If someone asks you why you’ve got a metal spoon with you, I suggest gazing into the sky and whispering “for the albatross”. Bonus points if you dance. 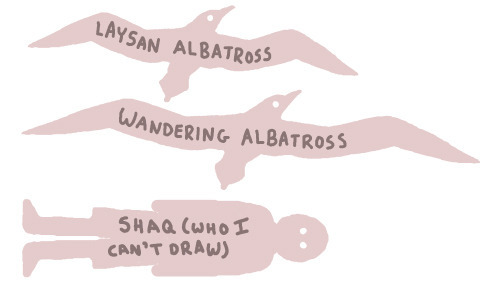 Reblogged for Earth Day and the love of goofy birds.